HAEMANTHUS ALBIFLOS AMA $5.00 South African white flowering bulb, evergreen strap leaves. HARRISIA JUSBERTII CAC $2.00 UNROOTED columns that are great for grafting, small hard spines. HATIORA SALICORNIOIDES CAC $1.50 The old fashion "Drunkards dream", looks like tiny inverted beer bottles stacked on top of each other. Orange flowers. Unrooted cuts. $7.50 Five to six inch pot sized. HELIOCEREUS HETERODOXUS CAC $2.00 Very dark orange, almost red, bell shaped blossoms, unrooted cuts. HELIOCEREUS SCHRANKII CAC $2.00 Dull green spiny stems with scarlet or blood red flowers. IBERVILLIA TENUISECTA CAC $20.00 Larger plants with EIGHT inch caudex. IPOMEA PLATENSIS CAC $9.50 Uneaven caudex that is easy to grow, plants for four-inch pots or better with nice caudex. JATROPHA CAPENSIS CAC $7.50 Caudex forming, seedlings for 4 inch pots. JATROPHA PODAGRICA EUPH $22.00 Seven to eight pot sized plants. The "Buddaha Belly". Bottle shaped caudex with bright orange red flowers. 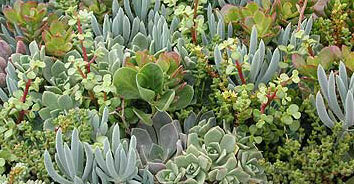 KALANCHOE BEHARENSIS CAC 3.00 The "Felt Plant", fuzzy leaves, will grow quite large, especially in the landscape. KALANCHOE BEHARENSIS CV. "FANG" CAC 4.00 Unusual teeth on the undersides of the fuzzy leaves. KALANCHOE BEHARENSIS MINIMA CAC 3.00 Dwarf "Felt Plant". KALANCHOE BEHARENSIS MONSTROSE CAC 4.00 Dwarf, compact and curly leaves. KALANCHOE BEHARENSIS NUDUM / OUT CAC 0.00 Dwarf, compact and curly leaves. KALANCHOE ERIOPHYLLA /OUT CAC 0.00 Fat woolly leaves. KALANCHOE FARINACEAA CAC 4.00 Attractive light scarlet flowers, leaves white-farinose. KALANCHOE FEDTSCHENKOI CAC 3.00 Attractive light scarlet flowers, leaves white-farinose. KALANCHOE FEDTSCHENKOI CV. "AURORA-BOREALIS" CAC 5.00 Unusual variegation of cream white, pinks and at times yellows, limited and unstable. KALANCHOE FEDTSCHENKOI VARIEGATED CAC 3.00 Cream white variegated leaf margins. KALANCHOE GASTONIS-BONNIERI CAC 4.00 Leaf surface is white to farinose with new platelets forming at the tips of the leaves. KALANCHOE HILDBRANDTII CAC 4.00 Tree like growth, leaves roundish, silver white and hairy. KALANCHOE LAXIFLORA CRAS 3.00 New. KALANCHOE LONGIFLORA CRAS 3.00 Available. KALANCHOE MARMORATA CRAS 3.00 Gray green leaves, in strong light have uneven blotches or speckling, these are lost in lower light, the "Penwiper Plant". KALANCHOE MILLOTII CRAS 3.00 Compact and minutely soft haired leaves. KALANCHOE MINIMA CRAS 3.00 Small gray-green leaves on sturdy wiry stems. KALANCHOE ORGYALIS CRAS 4.00 Tree type growth, leaves bronze colored and fuzzy. KALANCHOE PINNATA / OUT CRAS 0.00 Tree type growth, leaves bronze colored and fuzzy. KALANCHOE PUMILA CRAS 3.00 Prolific minutely farinose leaves, attractive reddish violet flowers. KALANCHOE RHOMBOPILOSA CRAS 3.00 Succulent triangular wavy edged leaves that fall off easily and form new plants just as easily. KALANCHOE ROSEI V. SEYRIGII CRAS 4.00 Serrated leaf margins. KALANCHOE SYNSAPALA CRAS 5.00 Serrated leaf margins. KALANCHOE THYRSIFLORA CRAS 3.00 White silver powdery leaves that with strong light have an extremely attractive reddish margin, very popular. KALANCHOE TOMENTOSA CRAS 3.00 Fuzzy silvery brown tipped leaves, the "Panda Plant". KALANCHOE TOMENTOSA "CHOCOLATE SOLDIER" CRAS 4.00 Overall chocolate brown coloration. KALANCHOE TUBIFLORA CRAS 3.00 Very prolific round tubular leaves forming plantlets on the ends that quickly start new plants if they fall to the ground, the "Pregnant Plant"
KALANCHOE TUBIFLORA HYBRIDS CRAS 3.00 Some have wider leaves, some longer than others, all very prolific and interesting plants. KALANCHOE VIGUIERI V. ANGUSTICEPHALA CRAS 4.00 Tall growing, leaves white and woolly. KEDROSTIS AFRICANA CRAS 12.00 Uneaven caudex with vine, easy summer grower, four inch pot size, limited. LEMAIREOCEREUS HOLLIANUS CREST CRAS 9.50 Uneaven caudex with vine, easy summer grower. LEDEBOURIA SOCIALIS CRAS 4.00 Onion like bulbs with strap leaves. LEUCHTENBERGIA PRINCIPAS CRAS 5.00 Unusual looking "Agave Cactus", large yellow daisy like flowers. LOBIVIA CAESPITOSA CRAS 4.00 Unusual looking. LOPHOCEREUS SCHOTTII MONSTROSE CRAS 10.00 Almost spineless sculptured looking column, thin form.